It’s already October! Time really flies around here. This stew should have been served up last month for Lebanese month, my fault for being lazy. Too many things going on and decisions were hanging on the balance etc, you know how it is sometimes. I concocted this up last minute just to catch up, but I also just soaked a big bowl of chickpeas so a chickpea dish will appear here in one way or another! 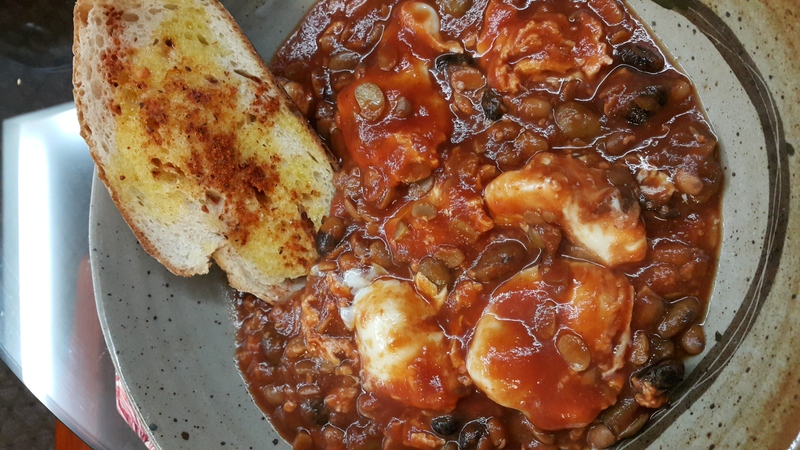 This little beauty is a combination of the beautiful Middle Eastern spice flavor called Harissa, and a Lebanese simple dish called Bean Stew. Few ingredients were added and modified, just to catch up as well as utilise whatever I had to finish up in the fridge. 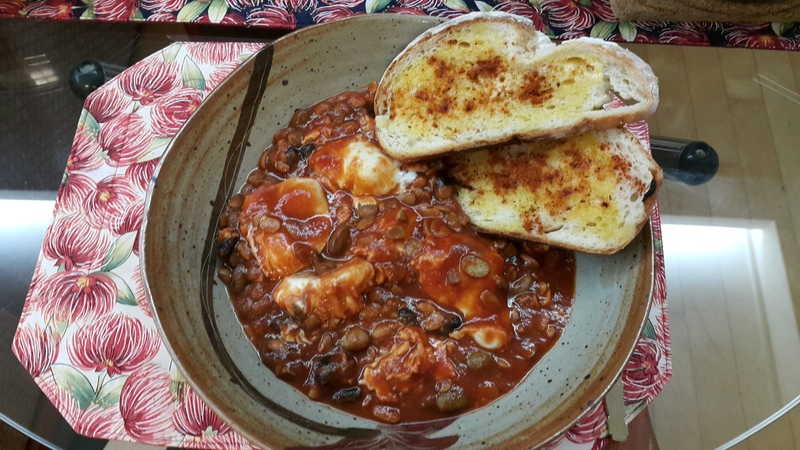 I stewed some beans with onions and tomato passata, and dropped in some organic eggs to poach in the thick tomato sauce. Looking at the stew, it looked too thick to be eaten alone so I scrummaged my cupboards and found a beautiful unopened tub of harissa powder mix. I thought to myself this would be perfect dusted on a piece of toast (beautiful slices of cheese bread in the freezer waiting to be eaten) and then at the corner of my eye I noticed a tub of melted butter! Oh the moment was utter bliss, everything came together just perfectly. Now I just have to get that toaster out of the cupboard, it’s probably got cobwebs on it by now. Leftover stewed beans – I slow cooked 500g of mixed beans (white, edamame, black, soy beans) with onion gravy granules, taste as you go to add or dilute with water, as per your tastebuds. *a tip for you, freeze any un-eaten breads and just toast them as and when you want to eat them, they will come out so fresh it’s as if you just bought them from the store. Just have fun, putting things together and best of all is finishing the big pot of beans that’s been sitting in the fridge for a week that’s been annoying you for the entire week!!! I need to mix things up a little bit more. Is it only me? I like cooking up for the week but by the end of it, the food just gets really annoying. Convenience over annoyance? Which one do you prefer?